This was such an exciting week. When Delia and I decided to host an Angela Carter Week we couldn’t foresee such a great success. So many fascinating posts and discussions. So many people who have either discovered a new favourite author or rediscovered her writing. What I liked best was the enthusiasm and the lively discussions and how all of our posts together are like one big tapestry, which mirrors and illustrates Angela Carter’s themes, the symbolism in her work, the topics. It was great to see that some picked up a second book after finishing the first and certainly will go on reading her. There were some critical comments as well. There should be, actually, after all, she’s a provocative writer and some of her topics are disturbing and can make a reader feel uncomfortable. I don’t think she ever wanted to please and that’s illustrated in some of our posts as well. We’ve had 34 contributions, one of which from Russia. I had to use google translate to read it and wouldn’t have seen it if the writer of the post hadn’t linked to my post. Unfortunately I couldn’t leave a comment. Thanks to everyone who joined us, to those who read Angela Carter’s books, wrote about them, discussed them and to those who read our thoughts on her work. A very big thank you goes to Delia, my co-host. Here are the links to all the participants’ posts. Wow such a great response! I didn’t have much time to look at other peoples posts during the week but will have a look when I get home from work those evening. Yes, it’s amazing. I’m pretty chuffed. I didn’t get the time to read all of them yet but I will soon. Thanks so much for participating. Thank you for co-hosting with Delia! I didn’t want it to end, I still have a review of Fireworks to write up and I got through half of Nothing Sacred which I will hopefully finish this week! My pleasure. That’s great, please add them to the linky, I’ll update this post as well. 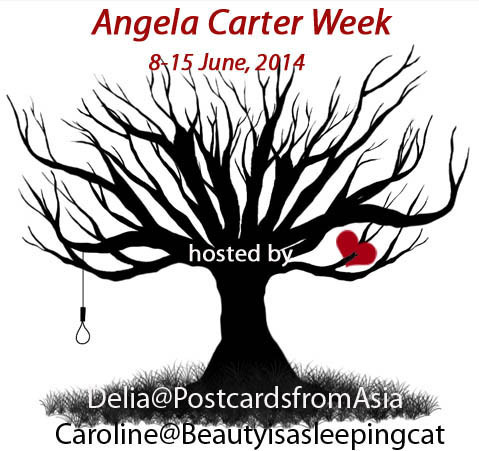 Thanks for hosting Angela Carter week with Delia, Caroline. I enjoyed participating in it and reading my first Carter novel. It was nice to see so many readers participating in it and reviewing Angela Carter’s books. It looks like ‘The Bloody Chamber’ and ‘The Magic Toyshop’ were the most popular books during Angela Carter week 🙂 It was nice to see a participant from Russia. I loved the Russian cover of ‘The Bloody Chamber’. Thanks for joining us, Vishy. Yes. there was a bit of a trend regarding her books. But there’s a post about almost all of her works. Thanks for hosting. Unfortunately, I got sick and missed the second half of the week, but I’ll catch up reading reviews over the next couple of days. I’d say the week was a success! Yes, it was. I hope you’re feeling better again. Thanks for joining us. I hope you do this again next year, so I have a good excuse to read some more Carter. You’re welocme. Thank you for joining us. It’s another type of reading experiece to immerse in one writer’s work, isn’t it? Great turnout. Thanks for hosting this event. My pleasure. It was a very successful event. I’m surprised and pleased. I’ll be adding your post once it’s up. This was a great event and thanks for hosting. Sadly I could not participate as I had planned to do as unexpected business travel got in the way. Angela Carter looks to be great author and I plan to read her work soon. Lots of great posts here also. I will continue to explore them. My pleasure, Brian. It’s too bad you couldn’t participate. I would have loved to read your thoughts. Congratulations on a fantastic week. And I love the way you’ve arranged the posts that were written. If only I had a bit more time, but I’ll be back when life is calmer to read through some of them. I love Angela Carter’s work and wish I could have reviewed something myself. Another year, perhaps! Thanks, Litlove. We would have loved to have you but after seeing your reading pile for the next edition of Shiny New Books . . . Thank you for joining. I’m so glad you like her. I’ll be interested to read your thoughts on The Magic Toyshop. Have a great holiday. Isn’t it amazing, in only just one week? I wouldn’t have expected it. I wasn’t doing much else than reading Angela Carter or posts on her work. 🙂 It was quite immersive. I’m really pleased. Thank you for participating as well. Great week. Thanks to the hosts and the participants. This type of event is what makes the international book blog community so worthwhile. Very true. Thanks a lot for joining us and for some great reviews.